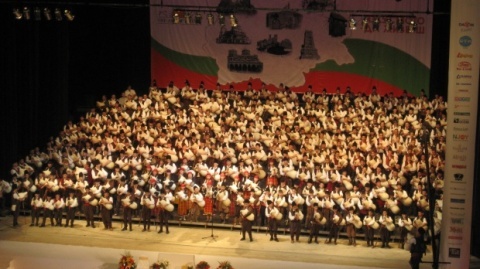 333 Bulgarian bagpipers set a new Guinness Record on Wednesday evening in Hall 1 of the National Palace of Culture, NDK, in downtown Sofia. The event was organized by the Art of Living International Foundation of Indian spiritual leader Sri Sri Ravi Shankar. "It is an honor for me to visit the country of roses for a second time," Shankar told journalists in Sofia ahead of the concert. "You are part of my dream of a global family. We live in a world of technologies and we are just a technological village in it. We need to become a global family. You have culture and traditions you need to preserve. This is why we are trying to set the world record today, to preserve Bulgarian culture," the Indian guru added. In order for the record to be recognised, the 333 musicians had to hold a rehearsal first. The presence of a specially invited jury was also mandatory. As the curtains parted and the bagpipers came onstage, the audience stood up to applaud. The youngest bagpiper was a 9-year-old boy and the oldest one was 80 years old. The majority of the musicians were from the Rhodope Mountains region in southern Bulgaria, where the so-called kaba-gaida is a traditional musical instrument. The bagpipers played a 9.13 minutes suite, as was required to set a new Guinness world record. The event revenues will go to social projects.